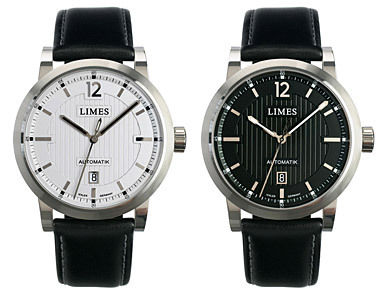 German watch brand LIMES introduces a superb new model, The Chyros, to their range of fine watches. The Chyros is named after the ancient Greek word for the ‘perfect moment’. The German made, stainless steel case, is beautifully constructed in three parts, with both polished and finely brushed finishes. The coined edge of the case is echoed in the textured ribbing on the dial. Available either in black or white, both versions have eye-catching, polished, applied markers and a distinctly German look. The white dialed version has black Super-LumiNova lume on the hands – black by day but luminous at night. The movement is the ultra-reliable Swiss-made, decorated, automatic Sellita SW200 TOP; visible through the mineral crystal display back. The crystal is slightly domed and has anti-reflective coating on both sides and the crown carries the Ickler logo. The LIMES Chyros is available directly from LIMES for US customers for US$ 1,290, including shipping and all US duties and for International customers for Eur 995 plus shipping costs.